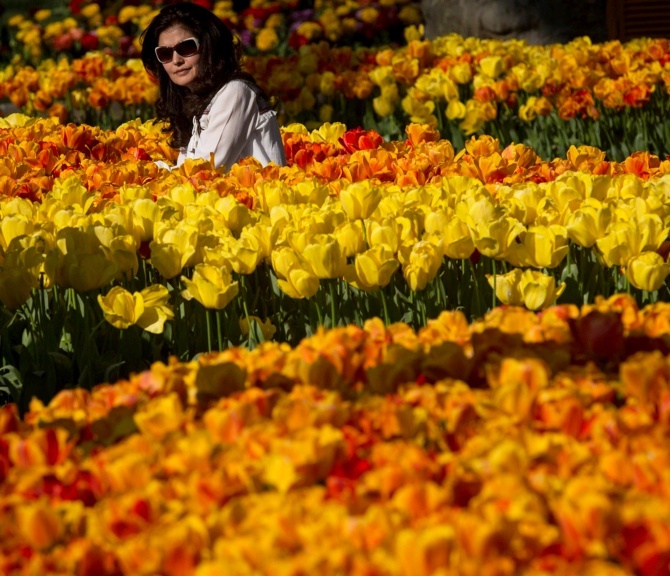 Rediff.com » News » Sight to behold: 30 million tulips blossom in Istanbul! 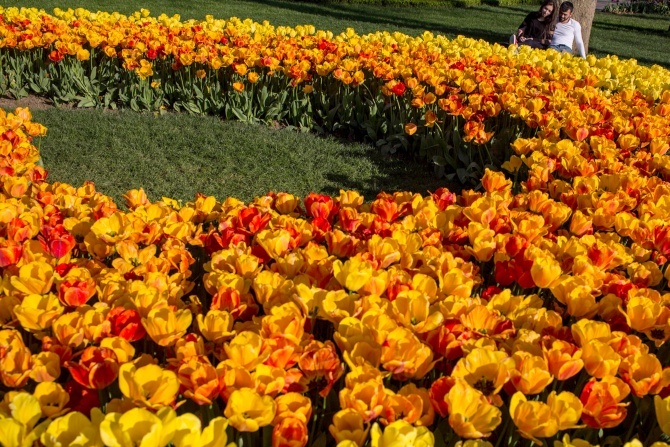 Sight to behold: 30 million tulips blossom in Istanbul! April is traditionally tulip time in Turkey’s largest city. The International Istanbul Tulip Festival, which has become one of the symbols of Istanbul and a well-known tradition, has started on April 1 and will continue until the end of this month. Every April since 2006, the Turkish government plants millions of tulips in Istanbul’s parks, avenues -- anywhere they can find an open ground! 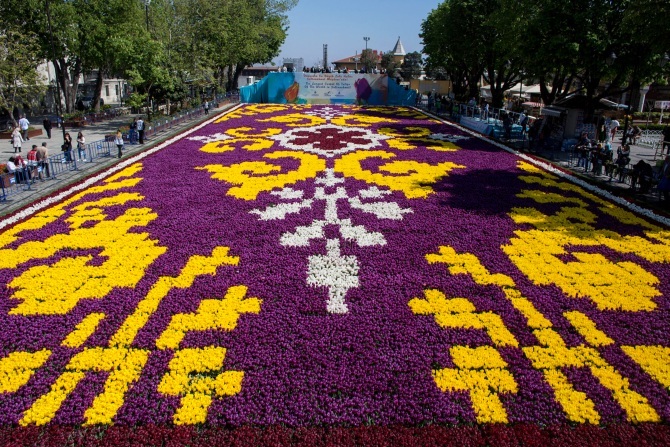 IMAGE: Covering 728 square meters at the historical square, this tulip carpet has 563,000 tulips and can be seen until April 30. This year, the estimated number of planted tulips is a whopping 30 million! 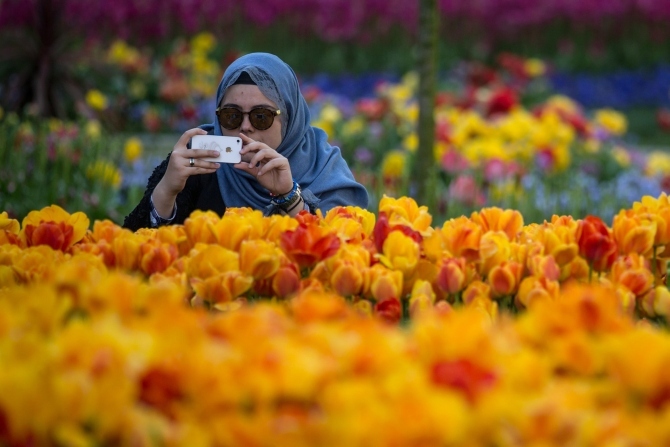 IMAGE: A woman takes a photograph of blooming tulips on display in Sultanahmet. The result is a glorious spring flower festival with brilliant splashes of color everywhere the eye can see. 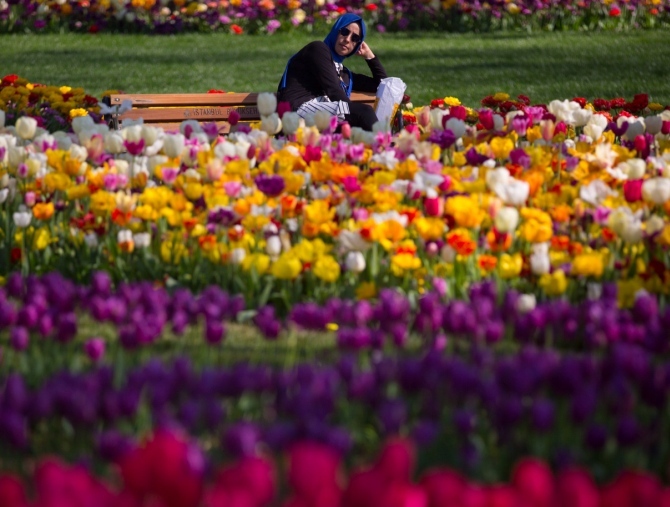 IMAGE: A woman looks at tulips in bloom at a park in Sultanahmet. Tulip is one of Istanbul's traditional symbols. During the Ottoman Empire tulips were often worn in turbans. In Arabic letters lale has the same letters as Allah, and tulips were considered a holy symbol. 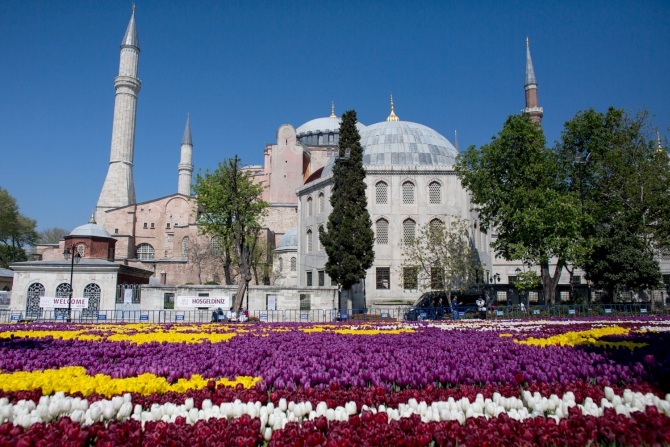 IMAGE: Tulips are seen in front of the Hagia Sofia in Sultanahmet. Tulips are commonly found in the motifs on Turkish ceramics. During April, you can spot these glorious flowers everywhere in Istanbul. 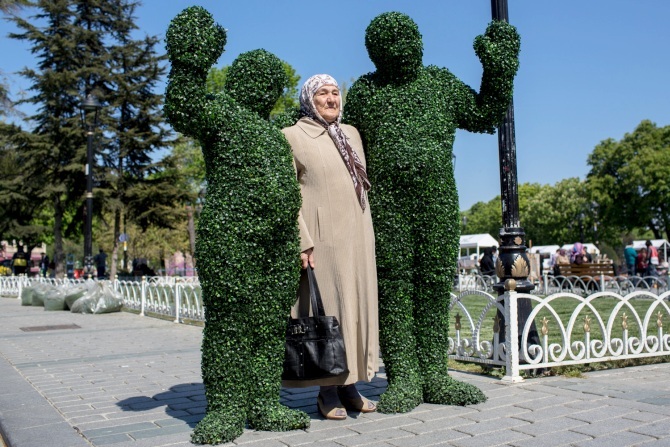 IMAGE: A woman poses for a photograph with tulip festival mascots in Sultanahmet. But for a real tulip treat and the International Istanbul Tulip Festival, you have to head to EmirganPark. It is one of the largest public parks in Istanbul and has several tulip gardens. 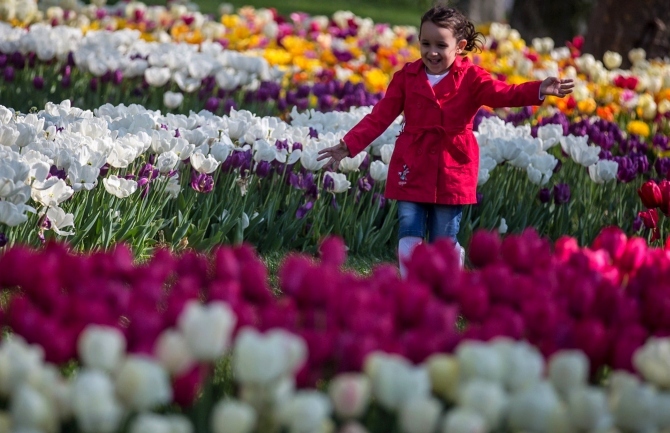 IMAGE: A young girl runs through a tulip display in Sultanahmet. More than 270 varieties of tulips fill the city each spring -- red, purple, white, pink and countless more turn the town into a realm of colours. The tulip buds are mainly grown in Çumra, a town of Konya, a city in the Central Anatolia Region of Turkey, but were also grown by villagers of Silivri, Çatalca, ?ile, Pamukova, and Geyve. 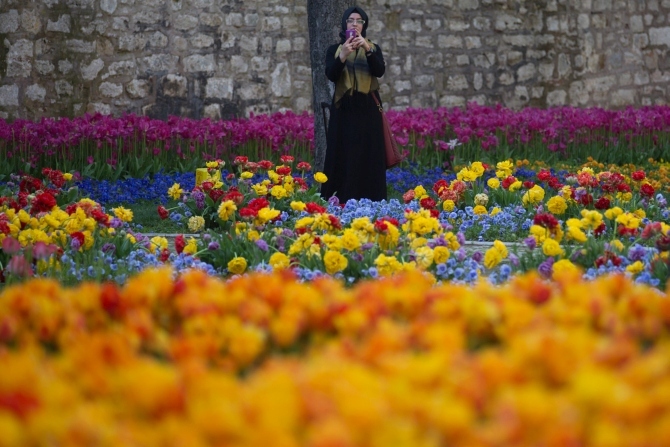 IMAGE: A woman poses for a photograph among blooming tulips on display in Sultanahmet. For the festival, millions of tulips were planted not just at the main festival venues, but also at Yldz Grove, Beykoz Grove, Fethipaa Grove, Hidiv Çubuklu Grove, Büyük Çamlca Grove and Gözda Grove. 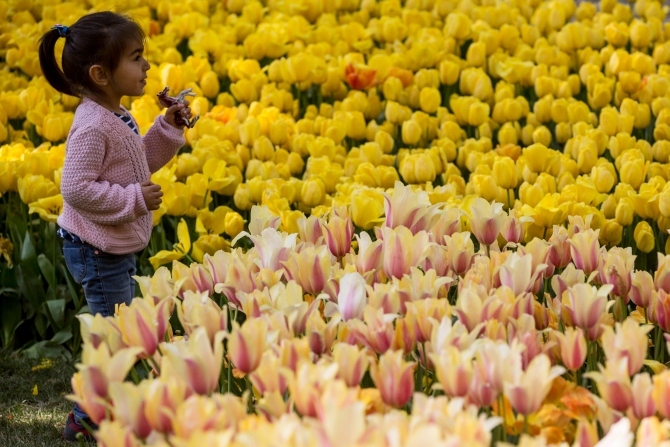 IMAGE: A young girlplays amongst a tulip display in Sultanahmet. The festival is organised by the Istanbul Metropolitan Municipality. Where is the plan to give wings to your dreams, Mr Modi?